Nice, they added a kandy bar logo to the wrappers. Simple yet effective, that's all we ask. I take a bite and it's not bad, feels a bit more balanced this year, though they could just be the flavor profile. there is a bit of low fat funk going on after bites two and three, but just go back to inhaling it and you probably wont notice too much. The mint is present but not super potent. There are cookie bits for a bit of texture change, though I wish they were more universal (scattered). It doesn't matter a ton since the bar is fairly small at 190 calories, but I think it would help distract from the texture of the low fat ice cream inside. The fudge swirl isn't standing out a ton on this first sampling. It's just all kind of getting inhaled but I still want to say this is built a bit better. The shell seems thicker, but again, maybe it's just a flavor profile that works better in this kandy bar form factor. On Second Scoop: The shell? It's fun to crunch. 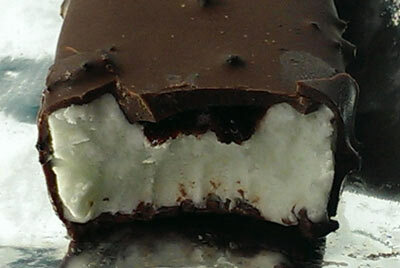 The fact this is a mint flavor in an ice cream candy bar form? That's fun too. The overall flavor profile? Good enough. That bit of weird, gummy, overly smooth funk to the ice cream? That takes this one back down a notch. 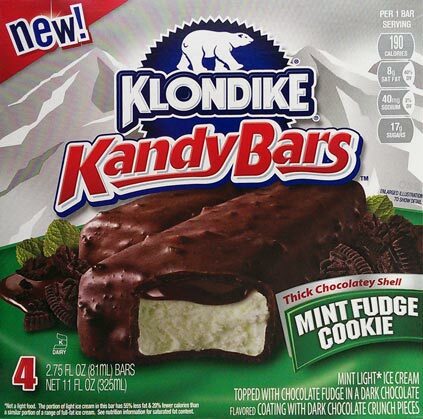 I like the idea here, but klondike just doesn't do quality filling anymore. 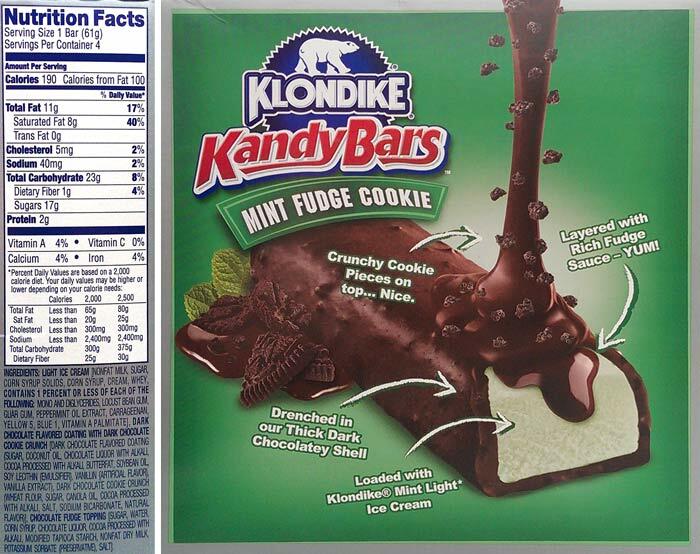 Dubba, it seems both the Kandy Bar brand and Klondike (and I'm thinking a lot of novelties in general) now use light ice cream. Why is that? I began to notice that and I think it could be the reason why these items don't taste nearly as good as they did when I remember them growing up. I actually appreciate and prefer light ice cream - Mainly because it allows me to have a treat while dropping weight. With that said, the picture on the box looks nothing like the actual item. That thing out of the box looks straight up nasty - Like a dog turd. I just found these at my local convenience store, but they said it was discontinued. Know anything about that? Yeah, they killed off all the Kandy Bars. I will mark them as discontinued.